The records are keys not only to understanding the past, but to the future facing cities like Wilmington, North Carolina; Jacksonville, Florida; Jamaica Bay, New York, and other ports around the country. Spurred by these tidal records, Talke and his colleagues have created computer models that show how deepening channels to accommodate cargo ships can cause higher tides and dramatically increased flooding from storm surges in some cities. The scrolls of records that day in 2011 were from Astoria, Oregon, on the Columbia River near where Talke is an associate professor of environmental engineering at Portland State University studying the hydrodynamics of estuaries, rivers and the oceans. Over the next few years, Talke and his colleagues unearthed more long-lost tidal tales covering New York, North Carolina, Massachusetts, Florida, Delaware, Virginia and other coastal areas. Each time, they took pictures of the records and returned to Portland State, where Talke’s students painstakingly transferred the information into a digital database of tidal gauge information throughout the 19th century. The earliest records dated to Boston in the 1820s, decades older than those previously available. Talke combined that old-fashioned sleuthing with high-tech modeling to examine changes in estuaries related to the dredging that began about 150 years ago in port cities. He wondered whether he would find effects similar to what he uncovered during a post-doctoral project studying the Ems River estuary on the border of Germany and the Netherlands. In Europe, he sought to explain why a dramatic increase in sediment concentration had occurred, leading to widespread oxygen depletion and an ecological disaster. What he learned there was that tides had shifted, almost doubling in a matter of decades. Why? Deepening, streamlining and widening the shipping channel over time had caused a dramatic change in the hydrodynamics of the estuary. Some port cities along the U.S. coasts show similar results to the Ems River estuary, although Talke cautions that each estuary is different. In a few places, he's found channel deepening has mitigated the risk of flooding. In others, the changes over more than a century have been dramatic, doubling the projected height of storm surge, far above what sea level rise, increased storm intensity and other factors might indicate. The effects, it seems, are most damaging upstream and away from the coasts—in places where people think they have less risk. Key to those findings are the historical records that Talke uncovered. They have allowed researchers to flip the usual role of computer models—predicting the future—and travel back in time to examine how estuaries and rivers behaved before channel deepening. When their models reproduce the historical tides that Talke’s team found in the paper records, it gives them confidence that the models are correct. "This is a neat use of archival records that can address important problems that have gone unnoticed and also give insight into how sensitive a system like an estuary is to changing conditions," Talke says. "Over a more-than-century time frame, we have greatly altered the underwater topography of our harbors and estuaries. We have literally moved mountains of dirt, exploded sea-mounts, straightened valleys and created superhighways for superlatively large ships. These alterations to our harbors are ubiquitous worldwide with effects that we haven't fully considered or even mapped out, in many cases." One of those places is Wilmington, North Carolina, which has one of the highest occurrences of sunny day flooding in the country—more than 80 days per year recently. Readings that Talke found dating to 1887 show that tidal range in Wilmington has doubled over the past 130 years, significantly changing the frequency of so-called nuisance flooding. Near the coast, tides have increased only slightly—a sign that the changes are driven by artificial alterations to the river. Using computer modeling, Talke and a student, Ramin Familkhalili, determined that the worst-case storm surge expected from a Category 5 hurricane has increased to 18 feet, up from 12 feet in the 19th century, when the channels around Wilmington were half today’s depth. Hurricane Florence flooded the city in September. "I think you can say part of the flooding was most likely caused by changes to the system," Talke says. He notes that Wilmington benefited from being on the side of the hurricane with winds blowing offshore, dampening the storm surge. To fully understand, he adds, researchers would have to do a full-scale model including rainfall and the wind field. As container ships have grown ever larger, spurred by the deepening of the Panama Canal, ports worldwide have dredged channels ever deeper—to 50 feet or more for the ports of New York, Baltimore, Norfolk, Charleston and Miami. Feasibility studies for those projects, including analyses by the Army Corps of Engineers, examine the economic prospects and some of the environmental impacts but have dismissed the effect of channel deepening on tide changes, flooding and storm surge. 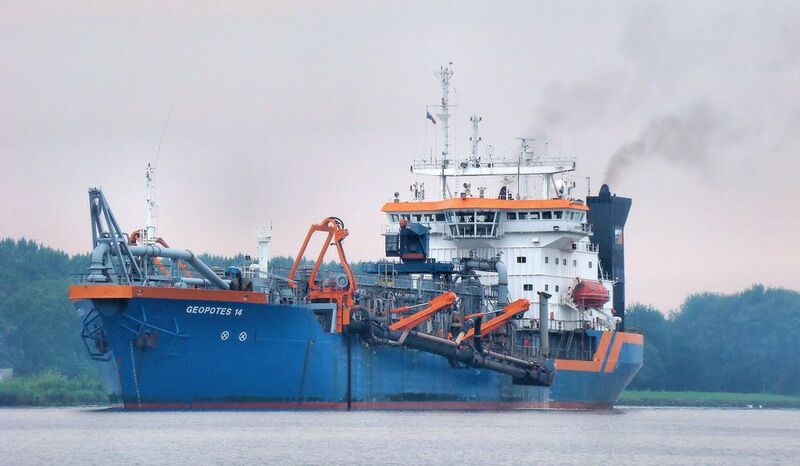 Globally, dredging projects are in the works for the Elbe River and the port of Hamburg, Germany's largest port; Rotterdam, Europe's largest port; and Korea's Busan Port, among others. The effect in some places has been to invite in the ocean and expose cities tens of miles upstream to extreme tides and flooding. But how can channel deepening increase tidal range and therefore storm surge and flooding? There are two primary factors. Dredging smooths the bottom of a channel, eliminating natural obstructions like dunes, rocks, grasses and oyster beds that impede flow, transforming it from a rough off-road trail into a slick NASCAR raceway. Without that drag on water flow, less energy is lost, increasing the incoming tide and storm surges. Deepening channels also decreases the effects of turbulence. Slow-moving water on the bottom doesn't mix as much with faster moving water near the surface (think of the old saying that still waters run deep), so surface waters essentially skate by without being slowed nearly as much. Talke and his colleagues also found that the reverse of channel deepening may be true. In a 2015 paper, they modeled the effect of shallowing New York's Jamaica Bay and discovered that restoring the channel to natural, historical depths would decrease tidal range and storm surge. Despite general trends, each location is different. Each storm is different. Channel deepening, for instance, decreases the effect of winds driving water up an estuary. Deepening channels in some places may have no effect or may even mitigate storm surge and flooding, something researchers say appears to be the case in Portland, Oregon, and Albany, New York. In those locations, a reduction in the slope of the rivers caused by channel dredging had a greater influence than channel deepening. But in Jacksonville, plans to increase the channel depth to 47 feet have been controversial following flooding during Hurricane Irma, a Category 1 storm in 2017 that reached historic surge levels despite occurring during low tide. A local environmental group, St. Johns Riverkeeper, has sued to stop the dredging. Over the past 120 years, the channel in the St. Johns River, which narrows as it carves through downtown 26 miles from the ocean, has been dredged to a depth of 41 feet from 18 feet. Like Wilmington, channel deepening and streamlining the river has nearly doubled the tide range around Jacksonville, according to Talke. Carl Friedrichs, chair of the Physical Sciences Department at the Virginia Institute of Marine Science, a part of the College of William & Mary, says Talke has been a leader in using historic tidal records to examine changes in coastal systems. "I have been very impressed by the work I've seen," Friedrichs says. "One of the themes of his work that's really neat is he describes unexpected non-linear feedbacks, where you think one thing is happening, but there's a cascade of other things happening." Deepening channels, for instance, leads to sediment moving to unexpected places, literally muddying the waters, and also increases the intrusion of saltwater into freshwater rivers, which has cascading effects. Christopher Sommerfield , a coastal oceanographer and geologist at the University of Delaware, has published papers with Talke and others on Newark Bay and Delaware Bay. In the Delaware estuary, Sommerfield says, channel deepening has increased the salinity upriver closer to Philadelphia and Trenton. As the salt line creeps upstream, it not only changes marine life but threatens the freshwater supply for Philadelphia (the Delaware River) as well as for industries that use the water (saltwater is expensively corrosive). In addition, Sommerfield says maintenance dredging removes sediment that once created mudflats and marshes along the river—important features in dampening wave energy. In a recent paper , Talke and his fellow authors argue that vulnerable coastal communities may be underestimating the combined impact of changes in storm tides, wave strength, the loss of wetlands and sea level rise. "I think people are starting to hone in on the fact that you don't just have a tide by itself, and you don't have a storm surge by itself or have sea level rise by itself," he says. "You can't treat them all independently, add it all up, and get the change in the risk. You have to consider them jointly." For Talke, the question now is how those clues once shrouded by the past can shape a safer future. "You have this variable effect where there are, in a sense, winners and losers. There are some places like Albany that see decreases in risk, and there are some places that see a big increase in risk," he says. "What I'm worried about is that we really haven't investigated this fully so we don't know which regions are going to be more impacted and which regions are a little bit more protected. "By learning from the past," Talke adds, "we can better prepare for the future."